I have always been a little mystified over Japanese chisels. So I wonder if the Eastern tool enthusiasts on the forum could help. First off; what does Oire nomi mean? Do Japanese chisels have special designs for specific jobs; i.e morticing, dovetailing and paring. Using a hammer with chisels. I know Japanese workers use a hammer, and I understand why there is a hoop on their chisel handles. If one were to use a mallet with a Japanese chisel, it wouldn't be long before the mallet was chewed up by the hoop. Removing the hoop would avoid this, but would the handle then suffer? Incidentally, please, please, don't take me to task over the ruler trick! There will be just one reply if anyone does; and it won't be rude! My membership dedicated to my Mentor. Vic Wyatt; GBNF. Personality and attitude can be confused. Personality is who we are; our attitude can depend on other people! Benchwayze wrote: If one were to use a mallet with a Japanese chisel, it wouldn't be long before the mallet was chewed up by the hoop. Removing the hoop would avoid this, but would the handle then suffer? No more than a comparable Western chisel. The wood used on some Japanese chisels is actually a bit tougher than the norm used in Europe so you could fairly expect them to hold up better. As for not being able to bring yourself to use a hammer on a chisel, isn't this all about trying something new? Benchwayze wrote: Am I considering buying some Japanese chisels? If they are superior for dovetailing I might. Some people will think so, others won't. I think this should be looked at thusly: consider what Western chisels have done and continue to do in the hands of an experienced user. Do we need more than that? Do you, or do you just want to get a new toy? Nothing wrong with that if that's what you consciously set out to do. But if you go into this fully expecting them to be the greener grass on the other side of the fence you might be setting yourself up for disappointment at the end of the day. Now about the ruler trick... haha, only kidding. The most notable thing about Japanese chisels is that they are much harder. This is immediately apparent when working harder timbers. Yes they have chisels for particular jobs. Paring for instance are longer and have no hoop. If you were to try, a hammer gives a much more positive feel. I have not used a mallet for about 40 years. However with your hammer phobia I would suggest a 5/8 long paring chisel, as a good place to start. Thanks for the response. We are in tune on certain aspects. I well recall the advent of Japanese chisels, and the excitement over their 'superiority'. My sentiments were similar to yours. 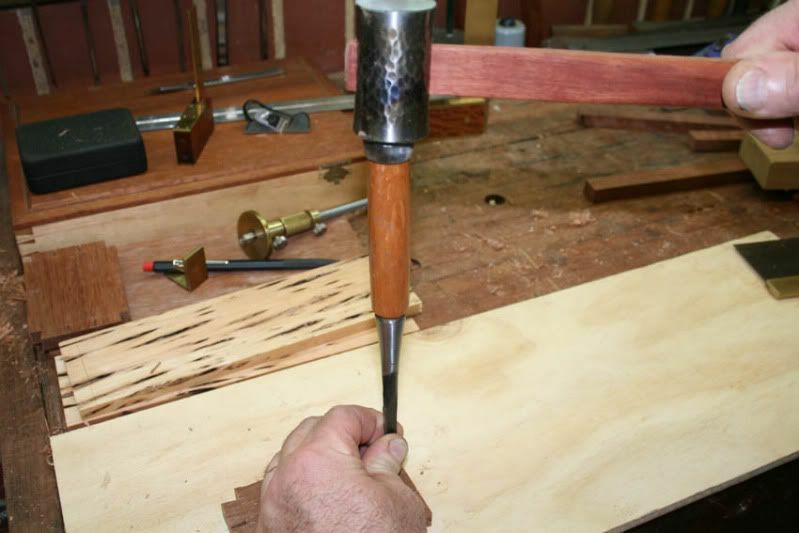 What had Western woodworkers used so successfully in the past? I was aware that Japanese workers had different methods, but couldn't really form a sound comparison of their work. Simply put, there are good and mediocre workers everywhere I suppose. As far as I could see, western furniture could be of the highest quality, and much of it was, and still is. The fact is I have always bought Marples brand chisels. My first ones were of 1950s vintage. Most of the chisels I have bought since have been older Marples, when I could find good ones. The steel was just better; to state the obvious. I have cut my share of good (and bad) dovetails with them. So maybe the same could be said of Japanese chisels, in my hands. I must still research into the purposes of these different chisels and what the Japanese names mean. As you say Japanese chisels are harder, and as far as I know are made from two types of steel beaten together. I have seen the line of demarcation in the metal, at woodwork shows of course. If I get some of these chisels, I shall have to adopt a new sharpening technique too. Never let it be said I flatly refuse to try anything new! As for hammering my chisels, well maybe I should try a proper dovetailing hammer, but on my Marple chisels? Now to the ruler trick. I follow your reasoning, but I was taught a slightly different approach for similar reasons. Instead of lifting up the iron, I was advised to hang the iron over the edge of the stone, so that only the first 3/8 to 1/2 inch was flattened. It was quicker, less hard work, and it was all that was needed to mate with the chip-breaker; with enough area to adjust. As a measure of good faith; I have recently acquired a Record No. 4-1/2 of some vintage. When I have tweaked it (As per your article of some years ago) I think I'll also give the ruler-trick a go. If it results in improvement, then I will use it in future. How's that? Benchwayze wrote: I have always been a little mystified over Japanese chisels. 1. “Oire Nomi “ refers to bench chisel. 2. 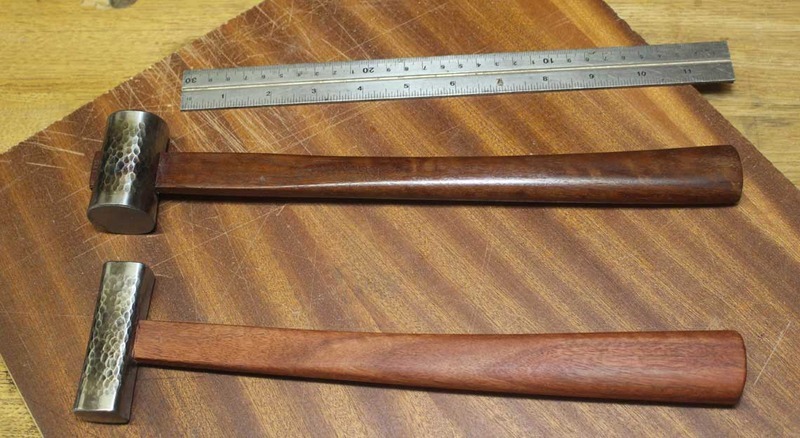 The steel hoop on the handle will not damage either a steel hammer (gennou) or wooden mallet as it is first set up (as part of setting up every Japanese bench chisel) by lowering the hoop and bending the wooden end over the top of it. 3. One never uses the Ruler Trick on any chisel, whether Japanese or Western. David would tell you the RT is only for plane blades. 4. The advantage of Japanese chisels lies in their construction, which largely is the laminated blade, which allows the cutting steel to be harder. The design of most is not ideal for dovetails since the lands are thick. You can find some (e.g. Koyamaichi from Lee Valley) with fine lands, and these are the ones of choice. This goes for Western chisels as well. Benchwayze, my advice would be that Japanese chisels aren't the best choice for you. By your own admission you do very little actual woodworking any more, and many brands of Japanese chisels need regular use (that or meticulous storage). Leave them in a chisel roll in an unheated shed and they will rust quickly and badly, far worse than most western chisels. Many Japanese chisels need to be taken out and used almost on a daily basis in order to ensure they get wiped down and oiled equally regularly. Having said that, I'd be the first to recognise it's your money so it's absolutely your choice how you spend it! custard wrote: Benchwayze, my advice would be that Japanese chisels aren't the best choice for you. Interesting, didn't realise that. I assume this is because of the soft mild steel in the lamination that is more prone to corrosion compared to Western chisels with Chrome vanadium? Thank you for your response; and as usual I have learned something. I didn't know about the corrosion differences. I must remember should I buy Japanese chisels. As for rust itself: My shop is a single garage, and the 'business end' is actually in the confines of the house. The metal, up and over door faces due south, and I attribute the dry, warm conditions to the the house, the metal door and its aspect. As long as I don't store planes, saws and and chisels close to the door, I just don't have a problem with rust. I give my tools a wipe over with 3in1 after use, because I know what sweat can do! Through my hiatus I kept an eye on them, and in all honesty I never found any tool that needed attention, other than a quick wipe over with oil, due to evaporation. Not a speck of rust, and in that I consider myself lucky. Incidentally, I have never used a heater in my shop. If it was really cold, I would close the door, roll up my sleeves and get on with work. Because of 'old bones', I might now have to think about a dry heater of some sort, but It really does have to be cold, to make my shop uncomfortable, with the door shut. Also if it is that cold, there's no one saying I HAVE to get in the shop and turn-to anyhow! I don't layout large sums on tools any more. For handwork, I have all I need, except space! I was just wondering what Japanese chisels were like, and if they would be a pleasure to use or not. I suspect I shall be finding out; if only to say I have "got the 'T' shirt", so to speak. However I don't envisage having a long rack full of them! I happened to come across an Antipodean on YT yesterday, and by chance he mentioned what 'Oire Nomi' meant. He also explained how to prepare the handle for use, on a new chisel. But I am obliged to you for the confirmation on the Japanese terminology. I did know about not using the ruler trick on chisels, and I mentioned it, to explain why I flatten just the fore part of the face to about 1/2" at the most; to cut down unnecessary work. I should make myself much clearer and I claim muddled thinking on old age! I still have my marbles, but occasionally one or two break loose and rattle around a little. Woodwork is keeping me on the right track though! Let's put it this way. I flatten only about an inch on a chisel, and just about 3/8" to 1/2" on plane irons. I am going to take David's advice and at least try a hammer for chiselling. I never abuse my chisels anyhow, and I'm not likely to be making any canal lock gates; so my dovetailing and the repeated 'tap-tap' shouldn't do too much damage. Anyhow thanks again Derek, and take care under those southern skies. I have used a wooden mallet, but it is not the same. The steel head of the gennou offers better feedback, and the strike is controlled power. Wood will absorb some of this. The use of a gennou, in contrast to pushing, enables the force to be directed exactly where it is wanted, and the combination creates the opportunity for precision. The bevel can be positioned, and then does not move from that spot, and the desired amount of force can be directed. I have two gennous, one 225gm for bench chisels and the other 375gm for heavier work. Now, in contrast to Custard, I have not experienced any more rust on my Japanese chisels compared to other chisels, even those unused for years. As with all tools, it depends on where you live and the climate. I say this since I do not want you put off trying one or two. My Koyamaichi chisels hold an edge longer than any other chisels, including Veritas PM-V11, which is an excellent steel. They are not harder to hone, but they are also a little more vulnerable to abuse since the hard steel that holds an amazing edge is also a little more brittle and does not like being used as a crow bar. Jim Kingshott, once a dyed-in-the-wool supporter of British steel, moved to Japanese chisels and would not give them up. It's due to the simple-ness of the steel. Very plain, like water hardening steel for white steel (think how fast an old file rusts), and the slightly more alloyed steels like blue #1 and blue #2 are similar to oil hardening steels like O1. In my estimation, the harder steel pits less deep than softer per unit of time, but that doesn't matter - on the hagane (hard) layer, you don't want any pitting - the steel is hard. I oil or wax my chisels if I'm not going to use them (I've got a gaggle of japanese chisels, from used older chisels that I got off of a japanese auction proxy service, to a couple of kiyotada's chisels - not many, but they are probably considered top range). Rust hasn't been a problem, but if I get a few out and use them on a project and forget what I do to store them normally, they rust very quickly. I don't find a lot of quality difference between a $10 old chisel that was intended for professional use (these have to be sourced from japan) and some of the very highly regarded new makers except most of the new very expensive chisels are really neat with more time spent on aesthetics. The low cost modern versions generally aren't as good as either, but can be decent - some are junk, and some are what i'd consider to be in par with a good western plain steel chisel (they're something like white #2 and not as hard as they say, so they sharpen and wear like a good 19th century western chisel - something some might even prefer). The quality of your work won't be any different with them, but you might be able to thrill yourself with things like cutting half blinds on an entire large hardwood case with nothing other than about 5 minutes of touch up swipes on your finest stone, and then nothing to do when you're done (because the chisel is in the same shape as it is when you started). My cap iron beats your lightsaber. Derek Cohen (Perth, Oz) wrote: Jim Kingshott, once a dyed-in-the-wool supporter of British steel, moved to Japanese chisels and would not give them up. Pondering out loud here, I wonder how much an innate dislike for sharpening plays into a person's adoration of Japanese chisels? There being no difference in how sharp you can make a chisel that's RC58 and one that's RC62, before any appreciable dulling of the edge occurs there isn't any difference in how they cut purely on the sharpness front (yes, granted that there's more to it than that including balance/feel). Now obviously there are a host of things one responds to in one tool versus another, and it can be difficult to pin down why you like one thing more than another. But even if the preference has a big aesthetic component I see no problem with that. I'd much prefer to use a pretty tool than an ugly one, other things being approximately equal! if he was buying japanese chisels (i had a video where he said something like that it pained him to admit it, but japanese chisels were just better) and using them, and presumably starting with something like a charnley forest or a hard arkansas stone, he'd have ended up using waterstones. Anything about 62 hardness, and oilstones are burnishing and not cutting much. It would've been frustrating. Below 60, they cut fast, and in between those two is sort of the sweet spot (which is probably why most of the chisels made in the late 1700s through early 1800s tend to be around that hardness). I chased super hard tools when I started and they do tend to push you toward artificial waterstones. I'd go further in saying that the chase for the magic natural japanese waterstone is due to their marginal performance when a chisel is super hard, and that full hardness japanese chisels (like 65/66) tend not to work that well with japanese natural stones. A quality stone from the typical mines in japan is about 15-20% natural aluminum oxide (from a volcano), so they can cut just about anything in theory, but the hardness of the base stone makes it not really the case. Too soft, and the abrasive doesn't bite. Too hard, and the abrasive dulls. I've never seen a natural stone that will cut steel that hard like an artificial stone. Usually not even close. Part of the art of getting better at sharpening tools is learning how to use stones that don't cut that fast and *not* doing work you don't have to do (thus, beginners are constantly chasing faster and finer stones - or think they are). I'd venture to guess I"ve had...maybe 75 oilstones (maybe more) and 200 waterstones of various types, and sold both for a couple of years on etsy. Learned a lot and typically use oilstones and prefer tools that are a step off of maximum hardness (like japanese tools that are between 62 and 65, not above that) and western tools in the 60-62 range.